Welcome to Reuan Thai Villa! This capacious 11 bedroom, located along the island’s southern peninsula, commands spectacular coastal views over Patong Bay and looks out to the beautiful city night lights of Patong. It boasts all the features you’d expect of a luxurious holiday home - from a private setting, to plush amenities and impeccable service. 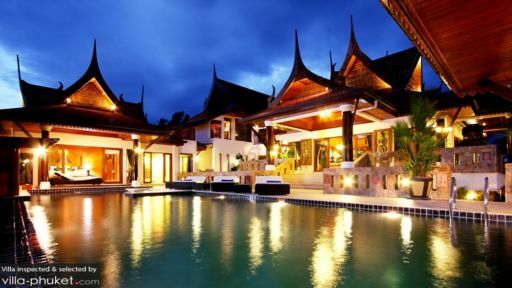 Containing a total of 11 bedrooms, Ruean Thai Villa makes a great bet for large group getaways. Offering flexible rental options, the sprawling villa is also available as a five to 11 bedroom abode to meet different travelling needs. Amenities like private en suites, air conditioners, satellite TVs and fridges are common across all bedrooms. Five of the rooms are equipped with king beds, four are outfitted with twins and two are furnished with queen beds. The two penthouse bedrooms are the highlights of the villa; one offers direct access out to the infinity pool, while the other features a private sala and outdoor seating area with unobstructed sea views! Enjoy views out to the sea when you take a dip in the sparkling 20-metre infinity pool! The sun-soaked outdoor compound comes complete with a bubbling jacuzzi, pool bar, outdoor showers and double loungers. A poolside gazebo comes fitted with a sofa set and coffee table - just perfect for enjoying breakfasts or sundowners while you take in the magnificent view! 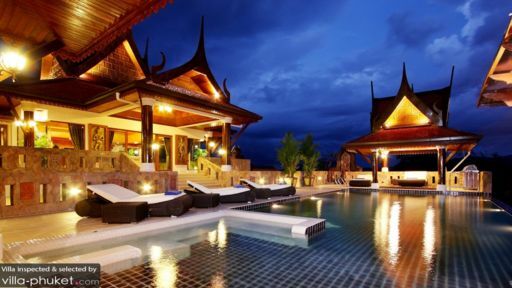 Reuan Thai Villa oozes class and luxury with its finely appointed common spaces. 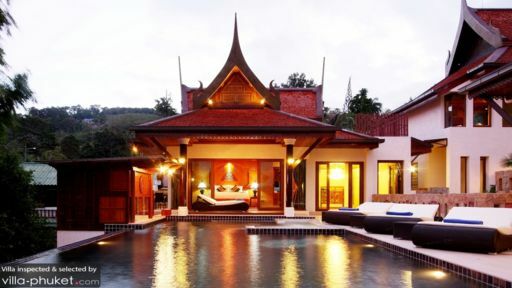 Housed in Thai-style living pavilions, the spaces feature a breezy, tropical-style design and an open layout. Entertainment facilities are spread out across two levels in two separate lounge areas. The ground floor living pavilion is where you’ll find the bar with TV, a fully equipped fitness room, a pool table, satellite TV and pillowy couches. Ascend the stairs to the second floor lounge. Outfitted with ample seating and state-of-the-art media equipment, the lounge looks out to the sea, and provides easy access to the pool and outdoor deck. The lively Patong central is just a 3-minute ride away from Reuan Thai Villa. While Patong is known for its bustling nightlife, there’s much more to the town than just nightclubs and bars. Jungceylon Shopping Mall, Patong Go-Kart Speedway, Shell World Museum, Kalim beach, Loma Park and Kathu Shrine are family-friendly attractions dotted across the town. A grocery store, restaurant and ATM machine are located a 5-minute walk from your villa.